Look, we’re pretty lucky to live where we do: there are beaches, stunning hinterland, and plenty of relaxed Queensland vibes. Because the cloak of winter is finally being pulled away (not that we can really call ** this ** winter, but hey) we thought there was no better time to pull together a to-do list of the most stunning spots in South East Queensland to explore this weekend. 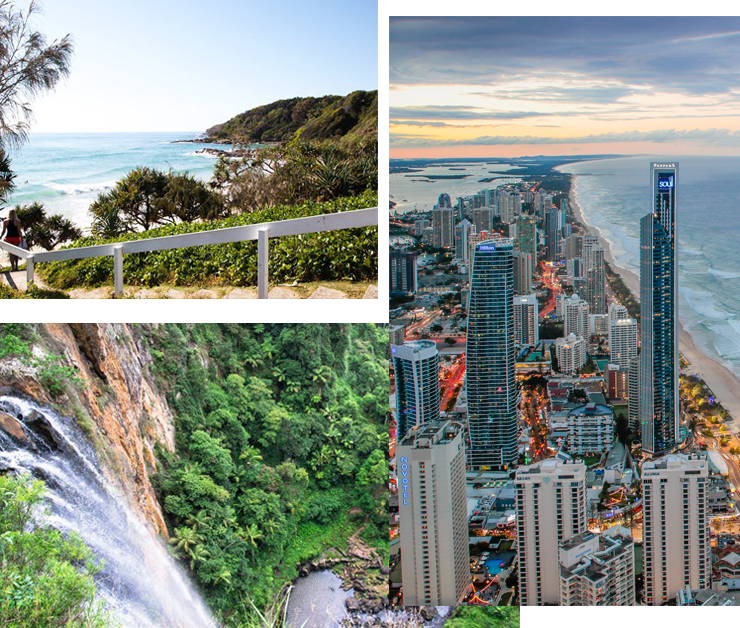 We’ve teamed up with SkyPoint and their observation deck to bring you this piece, because what else do you expect from Queensland’s most breathtaking view?! Exactly. SkyPoint’s Observation Deck is a no-brainer when it comes to beautiful spots in South East Queensland. 360-degree views across the Gold Coast and the Hinterland? Check. Bountiful Insta ops? Check. Beer and cocktails available? Double check. Stop by on a Sunday morning for the coolest buffet breakfast you’ll ever have, or stop by on a Saturday for sunset drinks, like 77 floors in the sky! Plus, on Sunday afternoons from 2-5 pm you can catch live music and a tasting plate. So, yeah, you’re going to want to add this to your weekend bucket list. We’ve all heard the advice: do NOT go chasing waterfalls—we know! But, guys, in South East Queensland we have some bloody beautiful waterfalls on our doorstep, so chase we will! In Brisbane, you can’t go past JC Slaughter Falls, on the GC, meanwhile, it’s gotta be the Twin Falls circuit where you can walk under a waterfall, and on the Sunshine Coast, Mapleton Falls is an easy circuit walk with a stunning view that's legit jaw-dropping. So, hands up who is still firmly in the wake up hungover phase, not in the wake up early and go climb a mountain phase of life? Yep, that would be us. BUT, guys, these mountain climbs are ridiculously beautiful, and the hike isn’t so bad, we swear. On the GC, we love the Burleigh Headland Walk for views for days, and, it doesn’t even really count as a mountain. In Brisbane, you can’t beat climbing through Mt Cootha’s various tracks, and on the Sunny Coast, it’s gotta be Mount Coolum. Don't forget to pack water. Feeling aesthetically inspired? Check out SkyPoint here. Image credit: The Edit Suite. Editor's note: this article was produced in partnership with SkyPoint. Thank you for supporting the partners who make The Urban List possible. To read our editorial policy, click here.